Plucky catering students at Rotherham College have had their hands busy preparing and cooking an unusual game dish in an exciting workshop. Rothbiz reported in December on the Teach Too project which ensures that catering and hospitality, travel and tourism and digital students can benefit from more industrial placements, masterclasses and workshops led by industry professionals. Catering curriculum manager, Will Sibley invited Mark Baines of Braehead Foods, one of Scotland's largest independent food wholesalers, to share his experience with catering students. Will said: "We approached Mark due to his highly-skilled background, such as working in Jamie Oliver's restaurant, Fifteen, and help us provide our students sought-after specialist skills." The aim of the Teach Too project is to drive excellence in vocational education and training through collaborative arrangements, encouraging people from industry to spend some time teaching their work, as well as giving employers a direct involvement in designing, planning and developing vocational programmes. Mark Baines, chef sales manager of Braehead, brought several raw pheasants and demonstrated to the students how to pluck, prepare and cook the birds to a restaurant standard. Mark said: "The students have cooked the meat on the bone, performed pan work and have produced a very superior product which is consistent form beginning to end. "I was so impressed that every single bird they cooked was to a restaurant standard – for them to produce that first time is impressive. I cooked a plate of food they've never cooked before, they went away and replicated it well." The workshop taught the participating Catering students the entire process of how the food goes from source to plate. Mark explained how the pheasants were sourced in the Scottish Highlands and would be prepared for presentation as a restaurant-standard game dish. Shauna Hatton, a Level 3 student in Professional Cookery, took part in the workshop. She said: "I now know more about game. When you work as a chef you may be given a full bird and told to make a meal out of it; I think this has helped us prepare for these demands in the workplace." 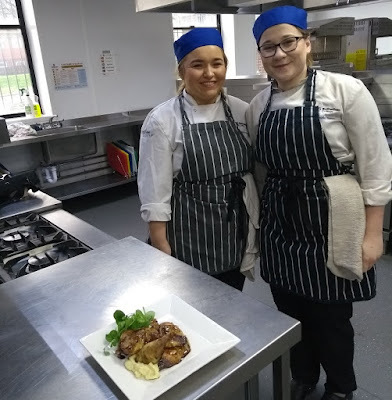 Louise Priestley, also a Level 3 student in Professional Cookery, added: "I've heard that some places buy pre-packed materials so to see the bird in its' raw form was very interesting; I think this will be useful for working in the industry."